I've debated for several weeks now whether or not to write this post, or whether is crosses the line of too much information. But I've decided that if anybody reading this is really interested in my life, then this is what's really going on. Things have been going relatively well at the house. The guy who does not do well with change has really done great considering we have a new weekend staff and a new roommate. However, when he is feeling any kind of anxiety, he is (rather than throwing things or pulling off the rearview mirror) expressing a desire to "pee in a cup." A couple of weeks ago, the weekend staff knocked on the door and said that he was saying he needed to go to the bathroom but was insisting on having a cup. We replied that we only "pee in a cup" at the doctor's office. This seemed to be an okay response as nothing else was said. Yet, in the last two weeks, this has been an almost constant request. It's odd, and it's even really funny, but it's also making me crazy. He hasn't had any other behaviors besides almost always asking to "pee in a cup." We have no idea where this came from! We've tried not to make an issue out of this hoping it would go away, but last week we realized that it's not going away anytime soon. We went to the doctor, the cardiologist mind you, and he was really excited about going to the doctor because he would get to "pee in cup." We told him several times that this wasn't that kind of doctor and that he wouldn't need to do that because the doctor just wanted to listen to his heart. But he was bound and determined. When we walked in the door, he immediately started asking about going to the bathroom. Staff took him and he wanted a cup. When he wasn't given one, he began threatening to pee on himself or on the floor. Even just writing that, I wonder how and why we do the job that we do. Crazy isn't it? Anyway, he was completely uncooperative with the doctor and his staff, but there was no way I was giving in because my thoughts are that if we feed into this even once, it's over! He had a bad day all day. After we got his afternoon pop and came home for dinner, I thought he was settling down some. Lowell had grilled chicken, baked potatoes, and corn on the cob and made a salad for dinner. When we had the plates on the table, once again the request was made to "pee in a cup." The food flying began when he was told no. 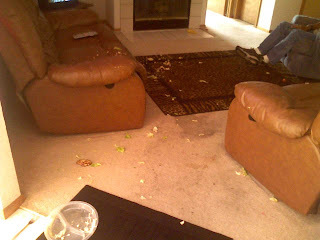 There was baked potato and salad EVERYWHERE! And he just sat in his chair in the midst of the food, and watched "Little House on the Prairie" while I tried to point out that Laura Ingalls never threw her food. The next day I met with two of the behavior analysts to try to figure out a plan to get this fascination to cease. We have decided to eliminate the phrase "pee in a cup" from our vocabulary and not to acknowledge him when he says it. I know it's not a phrase I use often (and maybe have never used outside of a physician's office), but I won't be saying it any more and we'll see how ignoring it goes.